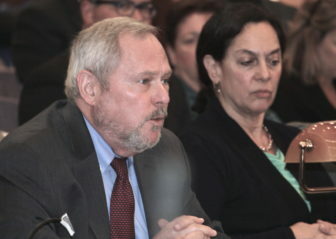 DCF consultant Robert Kinscherff and Commissioner Joette Katz discuss the state\’s juvenile jails at a legislative forum Wednesday. Under fire over questions about how youths are treated while incarcerated — and facing calls from advocates to close the state’s juvenile jails in Middletown — the Department of Children and Families Commissioner Wednesday reaffirmed her commitment to keeping the locked facilities she runs open. “Secure facilities are an important component of the juvenile justice system, and no jurisdiction in the country has a juvenile justice system without secure facilities,” Commissioner Joette Katz told legislators on the Committee on Children during a forum at the state Capitol complex. Wednesday’s forum was the first of two state leaders have scheduled to examine the conditions of incarceration for adjudicated youth and related issues. Legislators also plan to host a hearing at the state Capitol complex so the public can share their experiences. Numerous videos that show youths being restrained and put in seclusion — occurrences a state watchdog agency points to as evidence children are being “unlawfully” restrained — are expected to be presented at one of the future public meetings once children’s faces have been blurred so they cannot be recognized. In recent months, numerous national and state advocacy organizations have called for closing youth prisons. The Connecticut Juvenile Justice Alliance released a report on the eve of the legislative forum that both calls for closing the DCF-run jails and details how numerous other states have already begun to do so, including New York, Ohio and Texas. “Though many good people have attempted to institute reforms at CJTS, the facility by its very nature slips back into a correctional atmosphere that research clearly demonstrates is toxic for young people. It is past time that Connecticut put in the necessary effort to develop a system that works. CJTS and Pueblo cannot be part of such a system. Fortunately, there are examples from around the country that can guide us,” the Juvenile Justice Alliance report said. The alliance, formed nearly 15 years ago, includes the Center for Children’s Advocacy, Connecticut Voices for Children, Regional Youth Adult Social Action Partnership and The Tow Foundation. Katz warned state legislators Wednesday against idolizing other state’s efforts. She point out that Missouri still has seven youth jails, and New York automatically charges 16- and 17-year-olds as adults for every offense. “Every single one of these studies, every single state to which we can point, has some idiosyncrasies, so I just caution,” Katz told legislators. With pressure to close the facilities mounting, state legislators said during the forum they are contemplating the future of CJTS and Pueblo. Robert Kinscherff, the mental health and juvenile justice expert who authored one of the expert reports examining the juvenile jails, recommended that state legislators not make any decision to close the jails until data shows whether children are better off for having gone to the CJTS or Pueblo. Urban agreed. “It behooves us to give it the time,” she said. Kinscherff and researchers from Georgetown University’s Center for Juvenile Justice Reform reported that the state is unable to provide any data on recidivism or other outcomes. The lack of data is a problem that Sarah Eagan, the state’s child advocate, said has lingered for too long. Eagan’s office released the report last month that charged youths were “unlawfully” being put in seclusion and restraint. “The state must consider whether it wants to maintain an effort to keep ‘improving’ the state’s juvenile correctional facilities, given the lack of data regarding the facilities’ value and the increased risks that children face in juvenile correctional programs,” Eagan said Wednesday. Gov. Dannel P. Malloy deflected a question about whether CJTS and Pueblo should remain open after release of the reports by Georgetown, Eagan and Kinscherff. “Let me say this, CJTS is not the facility I would have opened,” he told The Mirror. Katz, who was appointed by the Democratic governor, told legislators Wednesday that CJTS serves a purpose. She said one larger facility is able to provide much more robust services to youths than smaller, regional facilities would be able to do. She also said a state-run facility is necessary so the state does not have to rely solely on private providers, some of which have tried to close at a moment’s notice in years past. She also pointed to the price tag that accompanied former Gov. M. Jodi Rell’s proposal to open smaller facilities across the state. That plan would have cost $15 million to build each of five new facilities and $9 million to run each one for a year. That would be more expensive than the $30 million it currently costs to operate CJTS each year, she said.